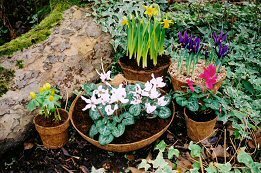 Have you ever thought of all that C02 emitting energy that goes into making a Plastic pot ? 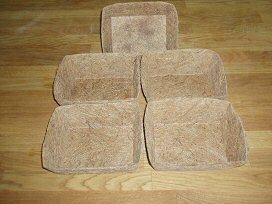 Coming from what would be the unused husks of coconuts, our coir fibre is a totally renewable, and constantly renewed,natural resource. 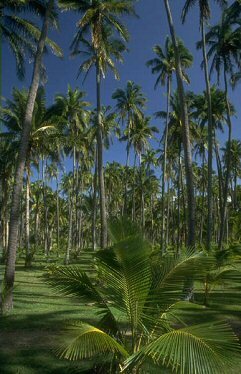 Naturally growing coconut palms actually help reduce C02 emissions - try saying that about an oil well ! 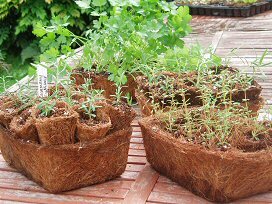 The coir pots, pressed into shape by the friendly people of Sri Lanka, come to you on scheduled ships, and happily biodegrade when you plant them, and so a natural resource returns back to your soil. Natures natural cycle rolls around again. Which pot costs more ? 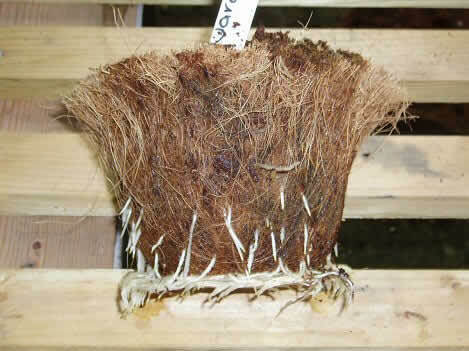 They last about 12 months above ground before they go ‘hairy’, and biodegrade over several months when planted. 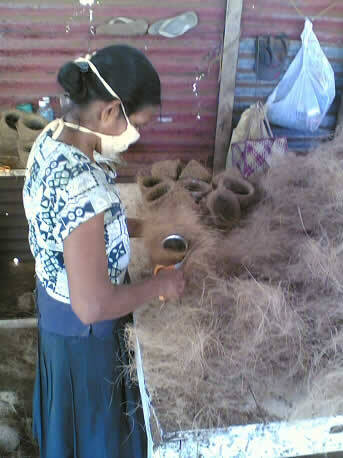 We say ‘ several’ as they are very natural products, with a lot of hand crafting about them. 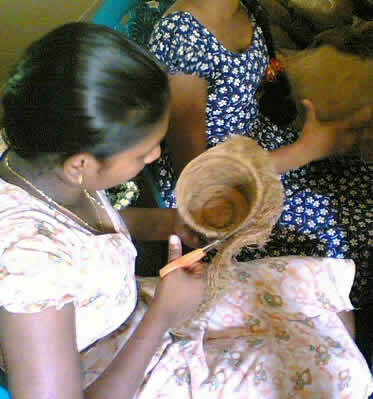 All of our pots are made in southern Sri Lanka from a sort of village women’s co-operative. 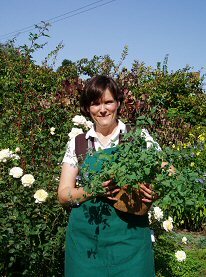 Let me show you how every single pot is carefully shaped by hand, spread with natural latex, by hand, and lastly given a short back and sides - you’ve guessed it - by hand ! 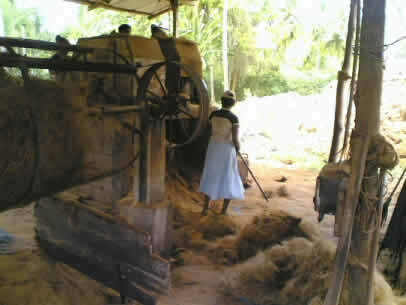 State of the art machinery is used by the ladies for both of these processes. 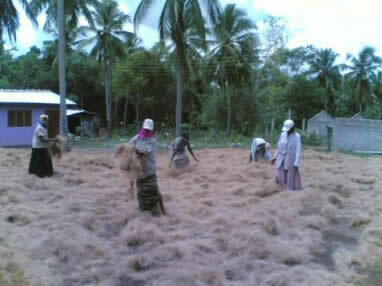 First the coir fibres are separated from the coconut husks. 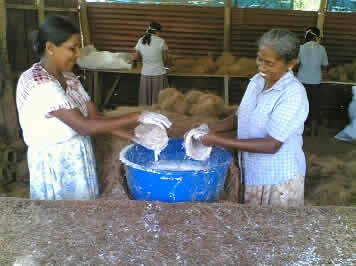 Then the fibres are tossed in a ‘drum’ to separate the coirgranules from the fibres. You can see these granules collecting underneath the drum. 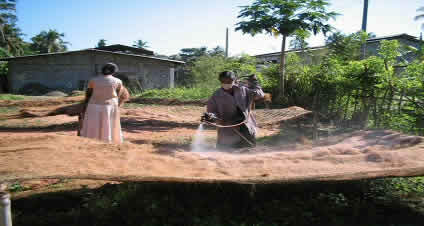 The fibres are washed in fresh water. Then off it goes to their “factory”. 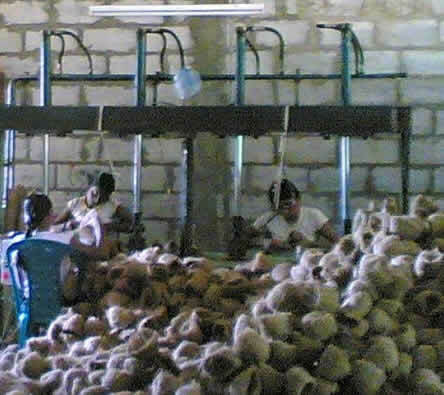 Here’s a part of the factory. 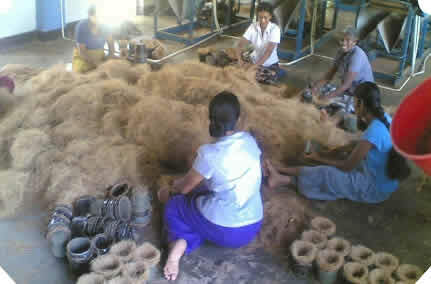 The fibre is being formed into pot shapes by being pushed into various sizes of pot “moulds”. 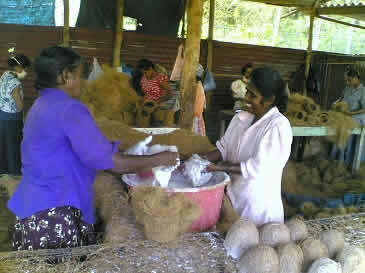 These ladies live in the Hambantota area of southern Sri Lanka. Not only is it one of the poorest areas of the whole island, it still echoes with terrible memories of the Tsunami. A lifetime of poverty, then all that devastation, but they don’t ask for our aid ! 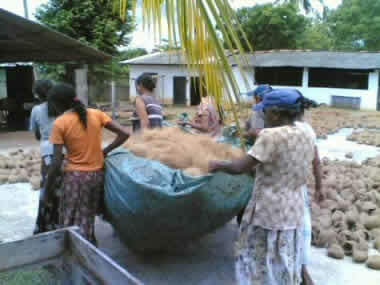 They know they’re future, and they’re childrens, depends on them working, depends on trade. It makes me so cross to hear people saying that we should stop trading overseas. I’ll put up with the emissions from scheduled ships if we can give developing countries a better future - and these lady’s families half the calories we consume !!! Oh sorry, my rant has made me come over all peculiar, now where was I ? What could be making them smile so much ! Then off go the pots to dry in the sun. The pots are turned over regularly. ! 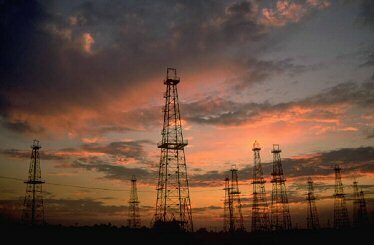 There is one more ‘high tec’ operation. Pressing the pots into their final shape and consistency. They don’t waste much on decor ! 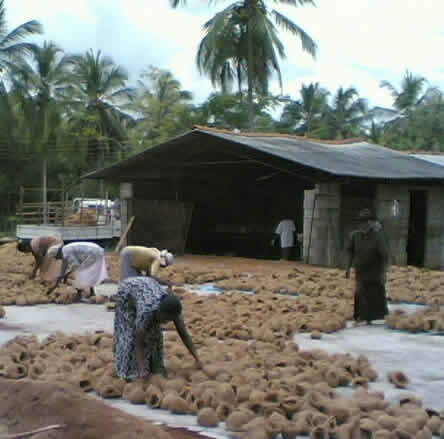 Each pot is carefully trimmed,inspected and packed. Then off these pots go on their travels. A journey which began in the warm earth of the Sri Lankan countryside, but which can end in enriching the soil of your garden. And a journey which offers fair free trade, and an income for just a few of all those folk who are not quite as lucky as us . 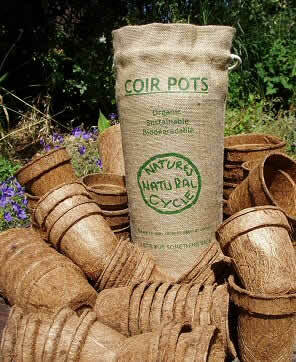 Plant these coir pots directly into the ground, there is absolutely no waste - you are just giving something back, letting that old natural cycle take over. 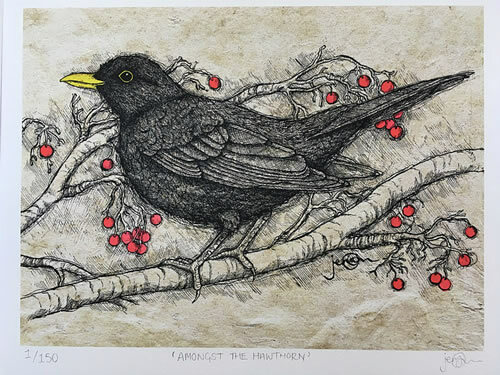 ‘Renewable resource’ in modern jargon - we just think, as with everything we offer here, we are putting something back that we have just borrowed. 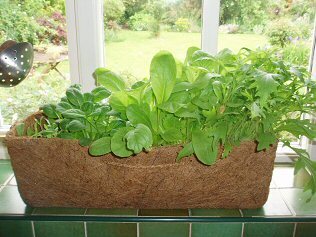 The organic natural Jute bag we package them in has a myriad of uses in the garden, and of course - after a couple of years - you can then compost it. 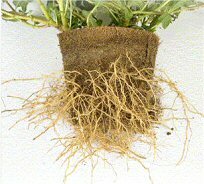 Remember, pot bound plants never quite recover. 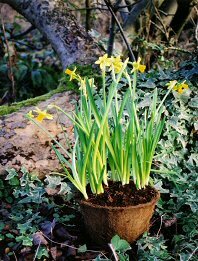 The narcissus below shows how this problem is avoided, having grown in one of our coir pots - left in an open greenhouse - for around 9 months. 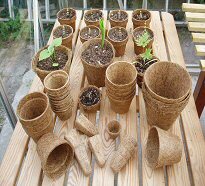 The coir pots are rimmed or plain - whatever we have been packing that morning ! These bags also make great gifts, introducing your family and friends to organic, sustainable growing. But how about a wider range for the larger garden ? ( nearly ! ) full of just plucked salad.